All BJP MPs have been asked to have lunches and dinners together to ensure that all are present for the no-trust vote, top party leaders said. No-Confidence Motion: The BJP and its allies have 315 members in the 535-member Lok Sabha. Prime Minister Narendra Modi's four-year-old government faces its first no confidence vote tomorrow, at a time all parties are prepping for state polls and the 2019 national elections, and the ruling BJP is leaving nothing to chance despite numbers. "We won't give up political power even one hour before since people have given us a mandate for five years," said a top BJP leader. All BJP lawmakers have been asked to have lunches and dinners together today and tomorrow to ensure that everyone is present for the no-confidence vote that begins at 11 am in the Lok Sabha, top party leaders have said. 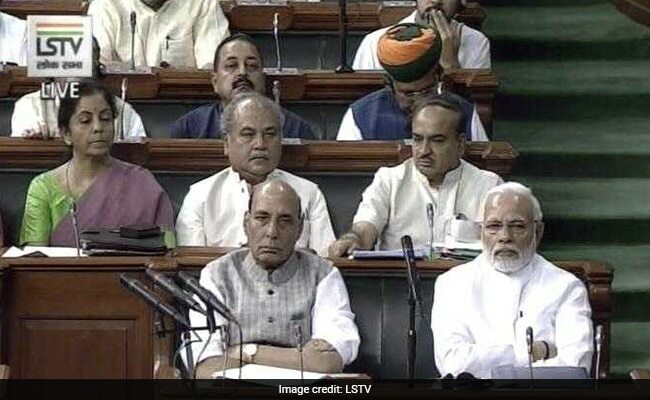 "We have issued a whip for all MPs to be present and vote against the motion, we are confident that all MPs will vote but in case they don't, there is a whip and required action will be taken," BJP sources told NDTV. The sources also said the BJP is talking to other parties for their support and is confident of AIADMK and the Telangana Rashtra Samiti, two regional parties that are widely seen as fence-sitters. "The Shiv Sena will also support us. Don't go by what they say on TV mikes. Nobody is leaving us," the sources said. Shiv Sena chief Uddhav Thackeray, who received a phone-call from BJP president Amit Shah, has already pledged his support. This morning, the Sena's Sanjay Raut had sounded cautiously non-committal. "In a democracy, the voice of the opposition should be heard first, even if it consists of one person. Even we will speak when it is required. During voting, whatever Uddhav Thackeray directs us, we will do," he said. Sources in Tamil Nadu's ruling AIADMK and Naveen Patnaik's BJD indicated that the parties will abstain from voting, which will help the government by bringing the halfway mark down. The Telangana Rashtra Samiti is also likely to abstain. The BJP and its allies have 312 members in the 535-member Lok Sabha, well past the required majority mark of 268.